Scalable Vector Graphics (SVG) is a language that allows you to describe two-dimensional vector graphics in XML format. The SVG language specification is available on the web site www.w3.org/TR/SVG/. 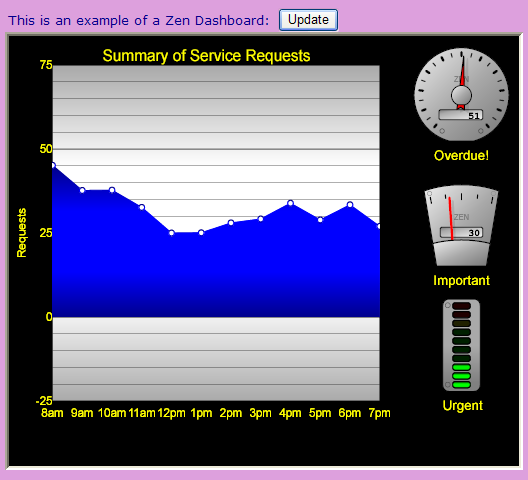 Zen uses SVG to display high-performance, data-driven charts and meters. You can use the built-in SVG components to define eye-catching corporate dashboards that update their statistics in real time. You can also define your own SVG components. An SVG component is any component that inherits from %ZEN.SVGComponent.svgComponent. These components render dynamic SVG images that change their appearance in response to data values. If you want to display a static SVG file on the Zen page, use <iframe>. If you want to use a static SVG file as the image for a button control, use <image>. The conventions described in the following topics apply to dynamic SVG components only. If no font-family is specified, SVG graphics use whatever default font the SVG engine provides. If you wish, you can specify the SVG default font for your system by setting the global ^%ZEN.DefaultSVGFontFamily to the name of a font-family. This causes Zen to create a CSS font-family definition using that font name. Zen automatically applies this font-family to all SVG text elements unless they explicitly provide a value for a CSS font-family. <svgFrame> is a Zen component that creates a rectangular frame on the Zen page, into which you can place SVG components. Only SVG components may appear inside this frame. Any dynamic SVG component, such as a meter or chart, requires an <svgFrame> to contain it. <svgFrame> inherits from %ZEN.Component.component. This gives <svgFrame> the usual component style attributes  height, width, label, etc  as described in the Zen Style chapter of Using Zen. This convention also allows <svgFrame> to be placed within a <page>, or contained within an <hgroup> or <vgroup>, just like any other Zen component. For details, see the Zen Layout chapter of Using Zen. The following figure shows a mix of Zen components and SVG components on a page. This is similar to the output provided by the sample class ZENDemo.Dashboard in the SAMPLES namespace. An <svgFrame> element may contain as many nested <svgGroup> and <svgSpacer> elements as are required to achieve the desired layout. An <svgFrame> may also contain <parameter> elements to support its svgPage attribute. For details, see the svgPage description in the following table. If true, this frame and its children are disabled. The default is false. If true, the user can use the pointing device (mouse) to drag the canvas of this frame. This updates the values of the offsetX and offsetY attributes and moves the shapes on the canvas. The default is false. "none"  The user cannot edit the contents of this frame. This is the default. "select"  The user can click on an SVG component to select it. "drag"  The user can click on an SVG component, hold down the mouse button, and drag the SVG component to a new position. gridX If snapToGrid is true, gridX defines the HTML width of each cell in the sizing grid. The default is 25.
gridY If snapToGrid is true, gridY defines the HTML height of each cell in the sizing grid. The default is 25. "vertical"  components within this group are laid out vertically. "horizontal"  components within this group are laid out horizontally. "flow"  components within this group are placed in rows. Items are placed horizontally until the width of the container is exceeded, and then components are placed on the next row. offsetX Offset, along the x-axis, of the coordinates of this frame from its upper, left-hand corner. The default is 0.
offsetY Offset, along the y-axis, of the coordinates of this frame from its upper, left-hand corner. The default is 0. The ondragCanvas event handler for the <svgFrame>. Zen invokes this handler each time the user drags the background canvas using a pointing device. See Zen Component Event Handlers. A boolean variable, done, is passed to this event handler to indicate if the operation is complete. If true, all mouse operations (sizing and dragging) are constrained to occur on the grid defined by gridX and gridY. The default is false. Controls the size of the SVG drawing canvas within the frame. If dragCanvas is true, the svgAutoSize property is ignored. Otherwise, if svgAutoSize is true, Zen calculates (and updates) the canvas size automatically based on the frame contents, with the minimum canvas size being svgWidth by svgHeight. If svgAutoSize is false, the canvas size is determined by the values of svgWidth and svgHeight. svgHeight Controls the size of the SVG drawing canvas within the frame. svgHeight gives the canvas height (using any valid SVG measurement units). If not specified, the default svgHeight is 100% of the height of the <svgFrame>. If height is also not specified, the default height (and svgHeight) is 100. Identifies a specialized CSP page that serves SVG content, defining styles and colors for SVG components in the frame. If provided, the svgPage value must be the name of a class that extends %ZEN.SVGComponent.svgPage. Otherwise, the frame uses the base class %ZEN.SVGComponent.svgPage by default. The value supplied for a <parameter> can be a literal string, or it can contain a Zen #()# runtime expression. svgWidth Controls the size of the SVG drawing canvas within the frame. svgWidth gives the canvas width (using any valid SVG measurement units). If not specified, the default svgWidth is 100% of the width of the <svgFrame>. If width is also not specified, the default width (and svgWidth) is 300.
zoom Decimal value, at least 1.0 (the decimal portion of the number may be omitted). This value indicates the zoom factor for the frame. 100 means no zoom; this is the default. Values larger than 100 increase image size, while smaller values decrease it. If true, this frame automatically zooms in and out in response to mouse wheel events. The default is false. Currently only available in FireFox. It is not possible for <svgFrame> to contain any component that inherits from %ZEN.Component.component, such as <iframe>, <html>, <spacer>, <hgroup>, <vgroup>, <button>, <link>, or any of the other Zen components discussed in this book. <svgFrame> can contain SVG components only. <svgGroup> is a special container designed to contain and lay out SVG components within <svgFrame>. <svgGroup> is not a Zen component (%ZEN.Component.component), nor is it a Zen group component (%ZEN.Component.group). <svgGroup> is an Zen SVG component (%ZEN.SVGComponent.svgComponent) with the ability to contain other Zen SVG components. If true, this group and its children are disabled (hidden). The default is false. Specifies how the SVG components within this group should be laid out. Possible values are "horizontal" and "vertical". The <svgSpacer> element is useful within <svgGroup> containers. Use <spacer> with a width value to inject additional space in a horizontal <svgGroup>, or height for additional space within a vertical <svgGroup>. The Zen <rect> element draws a simple rectangle. This is not the same as the <rect> element defined by the SVG language specification. Zen <rect> is a built-in Zen SVG component that you can place within an <svgFrame> or <svgGroup>. The Zen <rect> element takes up space within an <svgFrame> or <svgGroup>, but in a different way than <svgSpacer>. The conceptual difference between <svgSpacer> and <rect> is that <rect> may have visible style attributes, such as a fill color. rx Radius of curve for the corners (using any valid SVG measurement units). All SVG components have the following style attributes. These are entirely distinct from the attributes supported by ordinary Zen components. If true, this component is boundless. That is, its enclosing SVG element is a simple group <g> instead of the usual SVG element. The default is false. height Height of this component (using any valid SVG measurement units). The exact effect of setting this value depends on the component. In the case of built-in SVG components, the effect is usually straightforward. A height value larger than the height of the containing <svgFrame> causes the SVG component to appear cropped by the frame. If true, this component is disabled (hidden). The default is false. Changing the hidden state of an SVG component causes the layout of the SVG frame to be recalculated. That is, if layout is not equal to none the other components move into the space that was occupied by the hidden component. id Name that can be used to select the SVG component so that its attributes can be updated. For example, displays that use meters might periodically update the value that the meter represents. name Specifies a name for the component. position Used for placing a fixed controller over the rest of an SVG canvas. If the position of an SVG component is "fixed" this shape does not scroll with its canvas, nor can it be dragged with the mouse. If position is "relative" (the default) this shape scrolls, and can be dragged. preserveAspectRatio By default, Zen preserves the aspect ratio (height relative to width) for any SVG component when you change its size. If you set preserveAspectRatio to "none", Zen does not preserve the aspect ratio and allows your height and width changes to operate independently of each other. viewBoxHeight Height of the view box for this component (using any valid SVG measurement units). If a viewBoxHeight attribute is provided, its value is used as the height of the view box. Otherwise, the height value for the component is used. viewBoxWidth Width of the view box for this component (using any valid SVG measurement units). If a viewBoxWidth attribute is provided, its value is used as the width of the view box. Otherwise, the width value for the component is used. width Width of this component (using any valid SVG measurement units). The exact effect of setting this value depends on the component. In the case of built-in SVG components, the effect is usually straightforward. A width value larger than the width of the containing <svgFrame> causes the SVG component to appear cropped by the frame. x x position of this component (using any valid SVG measurement units). The actual position of the component may depend on the layout of its enclosing <svgGroup>. If the <svgGroup> has vertical or horizontal layout, this x coordinate is ignored. However, if layout="" this x coordinate takes effect. x is a positive value relative to an origin of (0,0) at the top left corner of the <svgGroup>. y y position of this component. A meter is an SVG component that displays a graphical representation of a single numeric value. Each meter is a class derived from %ZEN.SVGComponent.meter that generates the SVG required to display itself. To create your own style of meter, see the Custom Components chapter in Developing Zen Applications. This topic describes how to supply a meter with a value, lists the attributes that all meters share in common, then describes the unique attributes for each type of meter listed above. Where myMeterID matches the id attribute value for the meter, and myNewValue is a variable that contains a single, numeric value. This technique works when the meter’s controllerId value matches the <dataController> id value, and the meter’s dataBinding value matches the name of a property defined in the <dataController> modelClass. All meters have the following attributes, which define their style and behavior. Some of the built-in Zen meters provide animation. For example, if the meter uses a needle to indicate a value, animation causes the needle to swing from the previous value to the new value. If a meter supported animation, this attribute controls whether animation is on (true) or off (false). The default is "true". A text label for the meter. labelStyle SVG CSS style definition. (Styles within SVG are CSS compliant, but there is a different set of styles available.) When Zen lays out this meter, it applies this style to the label text. rangeLower Integer or decimal value that defines the low end of the range for this meter. The default is 0.
rangeUpper Integer or decimal value that defines the high end of the range for this meter. The default is 100.
scaleFactor Integer or decimal factor used to scale the values provided to this meter. Zen scales the incoming values before comparing them with rangeLower, rangeUpper, and so on. The default is 1 (no scaling). thresholdLower Integer or decimal value that defines a threshold for meter behavior. The meter does something when the meter value falls below this value. Typically, the thresholdLower value is greater than rangeLower and serves as a warning that the meter value is approaching rangeLower. The default is 0.
thresholdUpper Integer or decimal value that defines a threshold for meter behavior. The meter does something when the meter value rises above this value. Typically, the thresholdUpper value is less than rangeUpper and serves as a warning that the meter value is approaching rangeUpper. The default is 90.
value The current integer or decimal value of the meter (actually stored as a string). Although you can set this value while placing the meter on the page, generally you do not do this. Instead, you use getComponentById and setValue, or associate the meter with a %ZEN.Auxiliary.dataController, as described in the paragraph prior to this table. The fuel gauge is a narrow, vertical gauge with a needle that moves from left to right to indicate a value within a specific range. The gauge distributes marks or ticks proportionally across its range. The meter attributes rangeLower and rangeUpper define the range, with the rangeLower value at left and the rangeUpper value at right. You may specify warning lights to appear at the upper left or right of the gauge, above the ticks. These lights change color as the needle approaches them. The light at right changes color when the meter value rises to or above thresholdUpper. The light at left changes color when the meter value falls to or below thresholdLower. There is always a thresholdLower warning light with a default setting of 0. You must specify a thresholdUpper value if you want a warning light to appear at the top of the range as well. Several glow colors are defined in the class %ZEN.SVGComponent.svgPage. <svgFrame> always references this class, or some subclass of it, through its svgPage attribute, so these colors are always available to any SVG component in the frame. Text label for the face of the meter (similar to "Zen" in the illustration above). The indicator lamp is a rectangular bar that changes its fill pattern depending on the meter value. Essentially there are three possible states: above thresholdUpper, below thresholdLower, or between the two values. If the meter has a label attribute, this text appears in the middle of the indicator lamp with the style defined by labelStyle. The light bar is intended to appear off when the value is low, and fully lit when the value is high. The color of the bar shades from green (at the bottom of the scale) to yellow and red (at the top of the scale), implying that you should stop and address a problem when the value is high. Sometimes a low number indicates a condition that requires attention. If this is the case you can reverse the sense of a light bar by inverting the values for rangeLower and rangeUpper. Then the fully lit lamp indicates low values, and the off lamp indicates high values. Warning lights appear at the top or bottom left of the light bar. The top light changes color when the meter value rises to or above thresholdUpper. The bottom light changes color when the meter value falls to or below thresholdLower. You can specify what color you want to use for these lights. You cannot change the colors for the light bar itself (green, yellow, red). When you reverse rangeLower and rangeUpper, do not at the same time reverse thresholdUpper and thresholdLower. The slider is a vertical meter with a needle indicating a value between the rangeLower value at the bottom and the rangeUpper value at the top. The user can interact with the meter to edit its value, either by sliding the needle up and down with the mouse, or by clicking on the arrows at the top and bottom of the slider to increment the value along the tick marks. If true, the slider value is constrained (rounded) to the nearest tick mark displayed within the slider. If false, the slider value is based on the exact position of the needle relative to rangeLower and rangeUpper. The default is true. tickMarks Number of tick marks to display between the rangeLower and rangeUpper. The minimum is 0. The default is 10. The smiley is the familiar yellow circle with two eyes and a smile. The mouth line changes depending on the meter value. The mouth forms a smile when the meter value is near rangeUpper. The mouth is a horizontal line at the midpoint between rangeLower and rangeUpper. The mouth forms a frown when the meter value is near rangeLower. This is useful when a large number indicates a positive condition, and a small number indicates a negative condition. You can reverse the sense of a smiley by inverting the values for rangeLower and rangeUpper. Then the smile occurs at low values, and the frown at high values. <smiley> has the same general-purpose attributes as any meter. For descriptions, see the section Meter Attributes. <smiley> ignores any threshold values. The speedometer is a circular gauge with a needle that moves from lower left, all the way around to lower right, to indicate a value within a specific range. The gauge distributes marks or ticks proportionally across its range. The meter attributes rangeLower and rangeUpper define the range, with the rangeLower value at left and the rangeUpper value at right. By default, the speedometer displays its current value in a text box at the center of the gauge. However, you can specify that this text box actually contains a different value that you control separately. Use the independentOdometer and odometerValue attributes for this. You may specify warning lights to appear at the lower left or lower right of the gauge. These lights change color as the needle approaches them. The light at right changes color when the meter value rises to or above thresholdUpper. The light at left changes color when the meter value falls to or below thresholdLower. If true, this meter can display an additional value independent of its needle value, in a text box at the center of the gauge. If false, the value in the text box is the same as the needle value. The default is false. odometerValue If independentOdometer is true, this is the value to display in the text box at the center of the gauge. The traffic light consists of three circular lamps in a vertical column. From top to bottom, the lamps are red, yellow, and green. When the meter value is at or below thresholdLower, the bottom lamp shows green. At values above thresholdLower but below thresholdUpper, the center lamp shows yellow. At values at or above thresholdUpper, the top lamp shows red. This is useful when a large number indicates a condition that requires attention. Sometimes a low number indicates a condition that requires attention. If this is the case you can reverse the sense of a traffic light by inverting the values for rangeLower and rangeUpper. Then the red lamp indicates low values, and the green lamp indicates high values. <trafficLight> has the same general-purpose attributes as any meter. For descriptions, see the section Meter Attributes. <trafficLight> looks best when width is half of height. You cannot change the colors for the traffic light. The radial navigator is a specialized SVG component that displays the relationship between a set of data items as a dynamic, radial diagram. There is a central circular hub surrounded by a set of evenly spaced nodes. 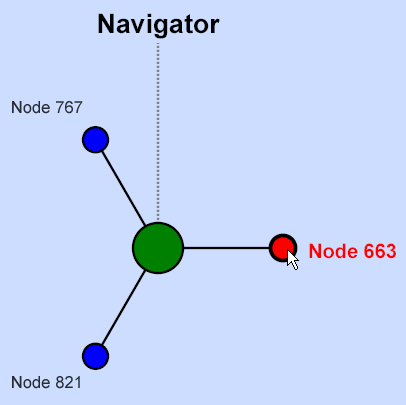 As you click on a node at the outer rim of the diagram, it becomes the hub node and the nodes to which it connects are shown circling it. hubStyle SVG CSS style definition. Specifies the style for the central hub. This style must include a fill value, or mouse events within this shape do not work correctly. Label text for the central hub. mainLabelStyle SVG CSS style definition. Specifies the style for the mainLabel text. nodeStyle SVG CSS style definition. Specifies the style for the radial nodes. This style must include a fill value, or mouse events within this shape do not work correctly. selectedIndex When the onselectNode event is invoked, the selectedIndex contains the index (0-based) of the currently selected node. If the user clicks on the central hub node, selectedIndex is -1. When selectedIndex is 2, this means no node is selected. Title text for the radial navigator. titleStyle SVG CSS style definition. Specifies the style for the title text. Text specifying the caption to display for this radial node. style SVG CSS style definition for the node. The style must include a fill value, or mouse events within the node shape do not work correctly. value Value associated with this node. The value may be a decimal or integer number, but it is represented as a string. When you work with %ZEN.SVGComponent.radialNavigator programmatically, you work with <radialNode> elements as members of the radialNavigator nodes property, a list collection of %ZEN.Auxiliary.radialNode objects. Each <radialNode> in the <radialNavigator> becomes a member of the nodes collection in radialNavigator, associated with its ordinal position: 1, 2, 3, etc. The onrender event handler for the <ownerDraw>. See Zen Component Event Handlers. This method provides the statements that render the SVG component on the page. The SAMPLES namespace offers <ownerDraw> examples in the page classes ZENDemo.SVGBrowser and ZENTest.SVGOwnerDrawTest.